Hydrangeas are absolutely, hands down, my favorite garden plant. One or two make a full bouquet, they require little care, attract few bugs and, with plenty of water they grow and adorn your garden beautifully year after year. I have 15 plants and I’d love more! 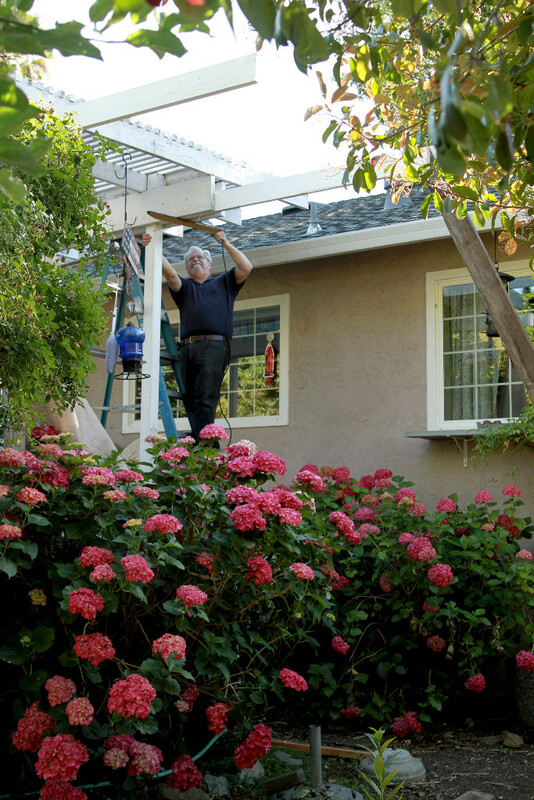 This time of year in Northern Calif. we often have sudden, scorching days….that’s a problem for hydrangeas. They do best with morning sun and afternoon shade. They don’t do as well against a stucco wall which reflects heat or in full afternoon sun unless it’s sun at a low angle in the very late afternoon. These past few weeks we’ve had triple digit temps and my plants were really getting scorched and I was really getting sad! Husband to the rescue! He saved my plants and has the scars to prove it! 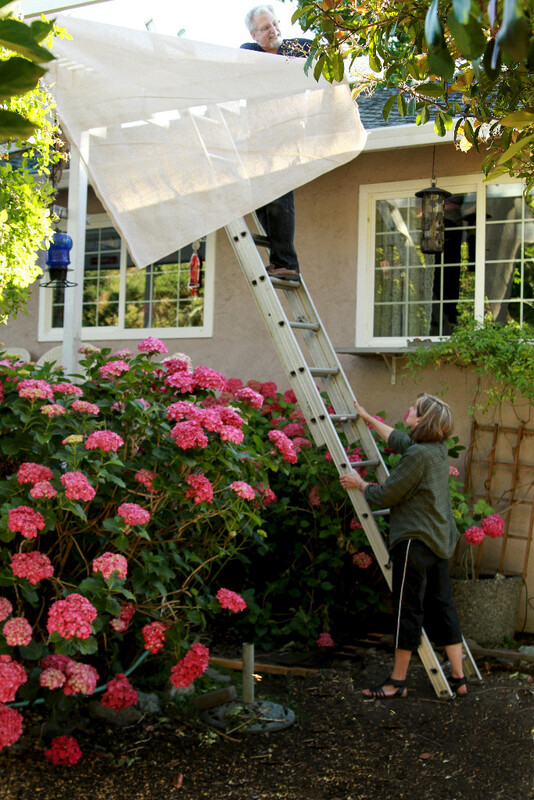 After falling off a ladder that tipped with him on top, he went back again and finished building a shade cloth overhang to save three beautiful plants that I’ve been growing around our deck since 1999. The Prezlosa, Red Star, and Buttons and Bows plants grew to nearly 5 feet tall and the mid-day and afternoon sun that missed them when they were small, was now burning the blossoms. Could you stand to see this beautiful Buttons and Bows plant get scorched? Or this once lovely plant…so sad! So, shade cloth to the rescue. We bolted two boards to the upper part of our deck cover and stapled the shade across them. It was way harder than it sounds! 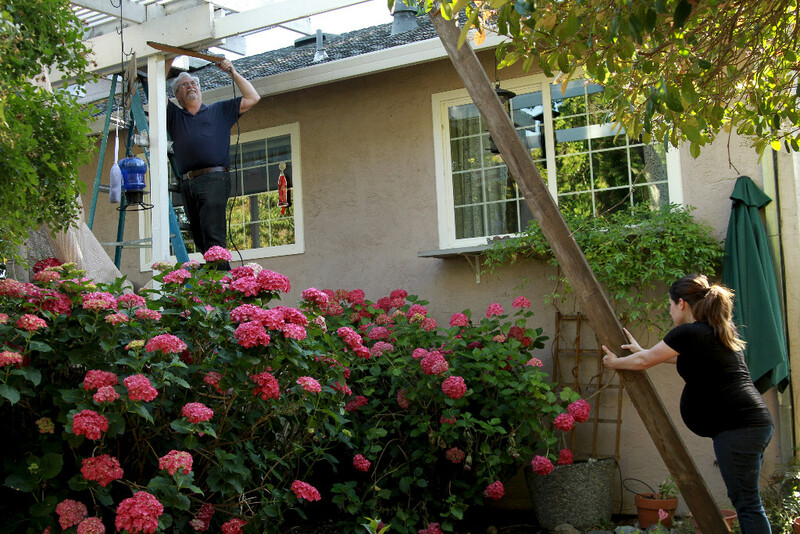 Especially when the ladder fell over with my guy on it! I helped too..in between taking pictures.. This was quite a production but the beautiful blooms are worth it! 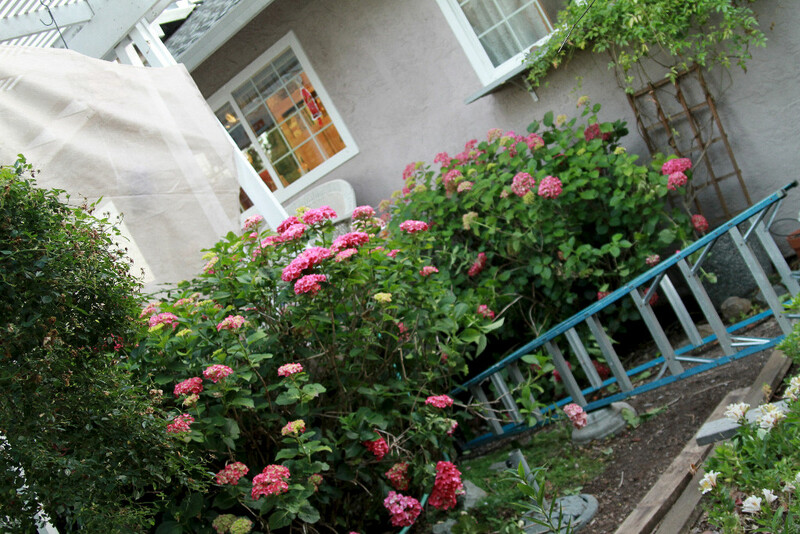 Hydrangeas will give you decades of loveliness if you give them what they like! Our happiest plants are planted in barrels beneath some overhanging trees were they get dappled light and no hot afternoon sun. Underneath a shade cloth patio cover is also a happy place…This Endless Summer plant is doing very well there but needs water every single day. Water is probably the most important thing you can give your plants. Because they have such large leaves they lose water quickly on a warm day even if they are protected from direct sun. It’s common for them to wilt and look nearly dead but then perk right up when the sun goes down and they get a drink. They don’t like soggy soil but they definitely don’t like to sit dry for very long. If your potted plants go dry, beware, since you can water constantly but the water may be running down the inside of the pot if the soil has peat moss in it and has dried out completely. Poke holes down through the soil and soak the plant slowly or sit the pot in a pan of water ( if it is small enough to manage) till the top is wet. Food is not as important. I feed my plants once in early spring with Miracle Gro general purpose food since it’s high in nitrogen. But, that’s all. 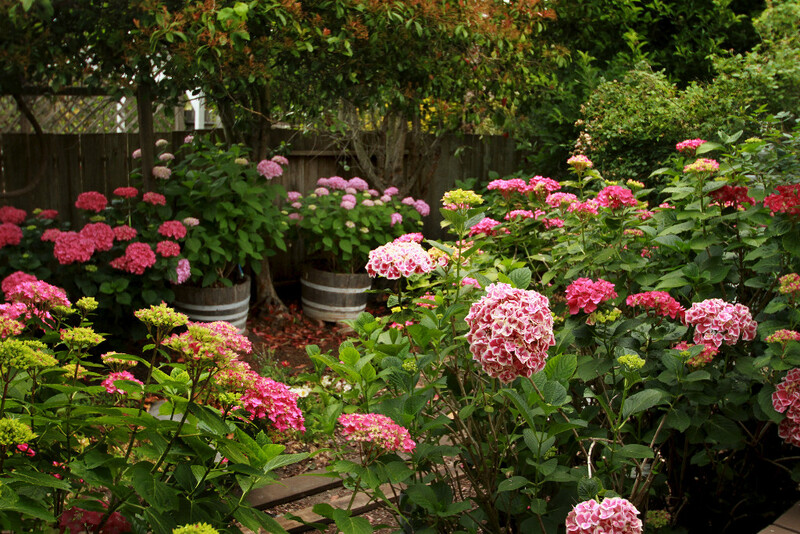 If you keep feeding hydrangeas through the summer as you would, say, a vegetable garden, you will have a lush plants with fewer flowers. 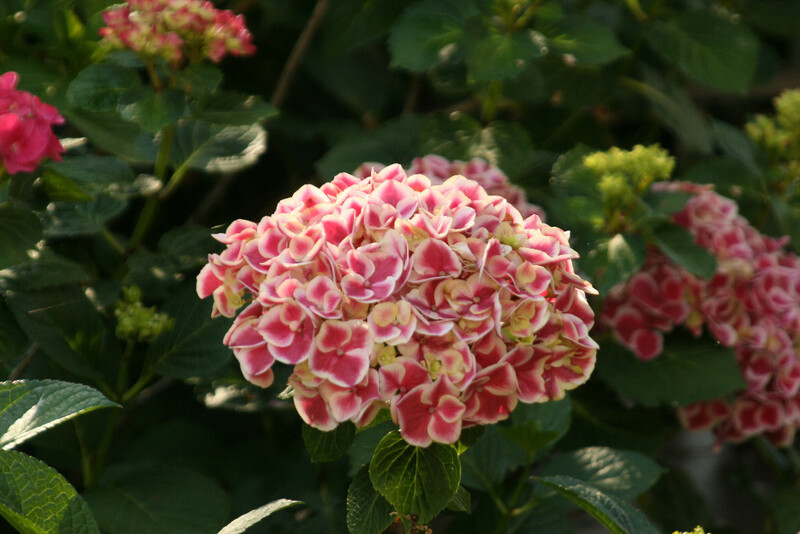 If you want to change the color of a hydrangea, trying it with one that is in a pot is easier since it’s easier to control the soil PH in a pot. First, get a soil test kit from a garden center and find out the PH of your soil. The test will tell you if your soil is acid or alkaline. To raise the PH to get alkaline soil, which produce pinker flowers, add Garden Lime. 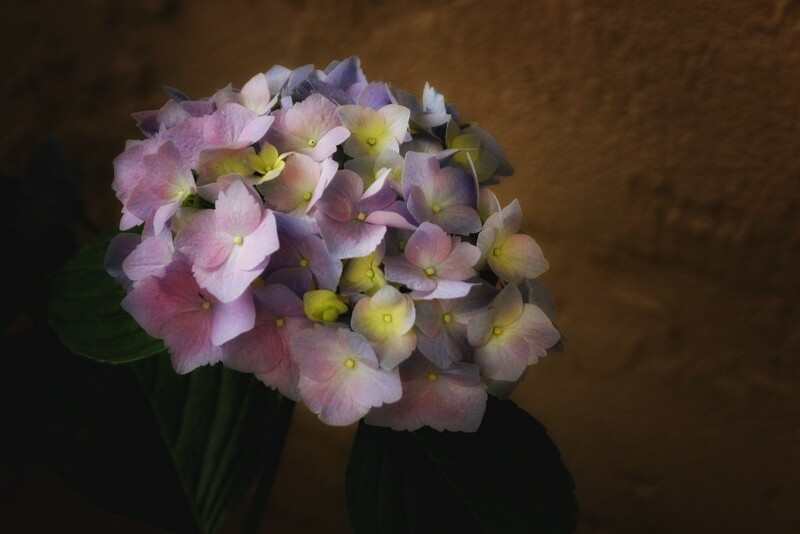 To make the soil more acidic, for bluer flowers, you can add ammonium sulfate. You can also try adding saw dust, peat moss or oak leaves. Even coffee grounds are somewhat acidic but it may take a lot to make a difference. 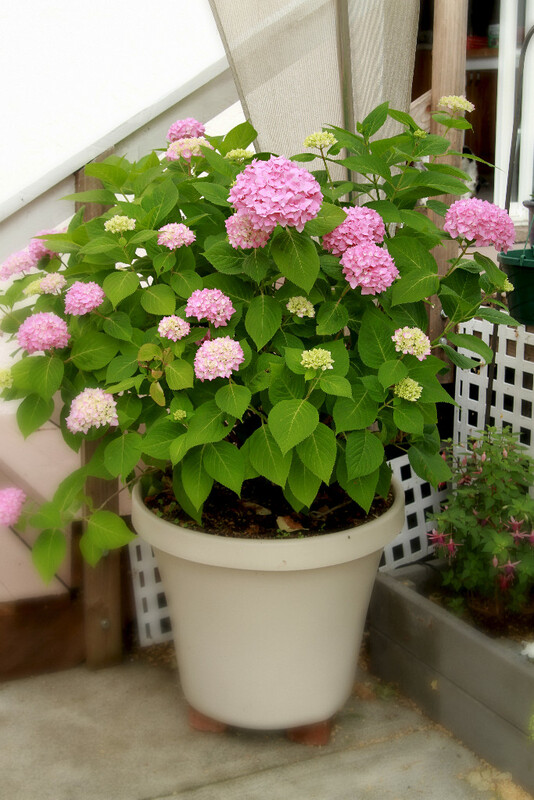 (I’m adding my coffee grounds to a potted hydrangea all summer…I’ll let you know if it makes a difference!). You can get these products at a garden center or Home Depot. 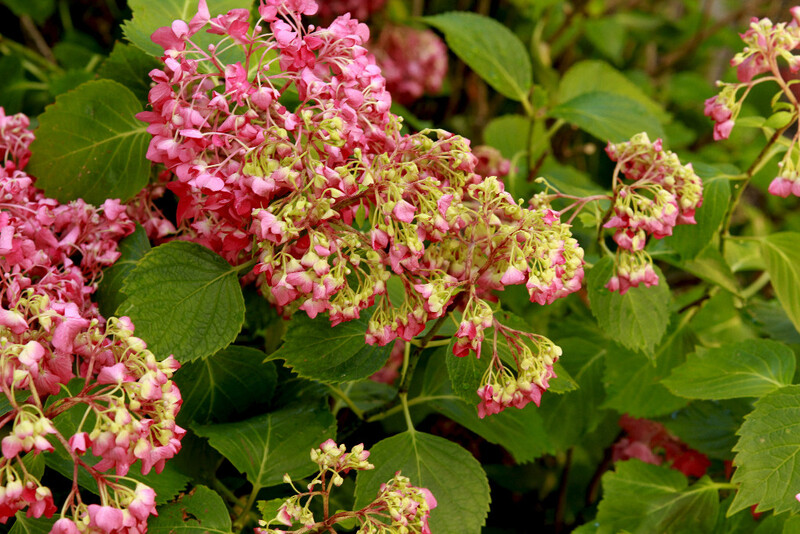 (The package will tell you how to use it if you get the kind that is specifically marketed to change Hydrangea color). You need to treat the plants in fall or early spring before buds develop. Sometimes it can take more than one year to change colors and if you don’t keep up the treatment the plant will revert to it’s original shade. Please Pin to share and “Like” our Facebook page to get updates!